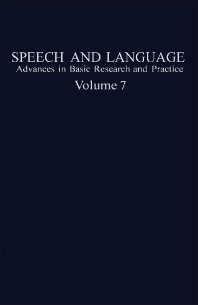 Speech and Language: Advances in Basic Research and Practice, Volume 7 presents contributions that discuss a wide array of topics on speech and language processes and pathologies. This volume contains 11 contributions focusing on a broad range of topics on speech and language. Topics discussed in the book include auditory processing deficits in aphasic individuals and the factors that influence their performance; the functioning of the auditory system in stutterers; speech training aids for the deaf; and techniques for the assessment of language abilities in children. The morphological structure and mechanical properties of the vocal fold; the factors which participate in determining the location of a boundary signal and its amplitude; and the assessment and remediation of communication behavior in moderately retarded developmentally disabled adults are likewise covered extensively. Linguists, speech pathologists, and other language experts will find the book very insightful and informative.